Organizations face challenges today that are too messy and complicated for consultants to simply play doctor: run a few tests, offer a neat diagnosis of the Ã¢ÂÂproblem,Ã¢ÂÂ and recommend a solution. 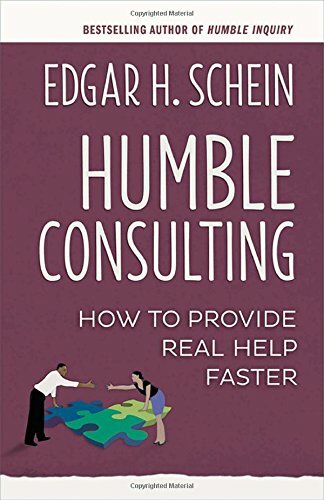 Edgar Schein argues that consultants have to jettison the old idea of professional distance and work with their clients in a more personal way, emphasizing authentic openness, curiosity, and humility. Schein draws deeply on his own decades of experience, offering over two dozen case studies that illuminate each stage of this humble consulting process. Just as he did with Process Consultation nearly fifty years ago, Schein has once again revolutionized the field, enabling consultants to be more genuinely helpful and vastly more effective. About: Consulting in Complex and Changing TimesOrganizations face challenges today that are too messy and complicated for consultants to simply play doctor: run a few tests, offer a neat diagnosis of the âproblem,â and recommend a solution. About: New approaches are causing consultants and coaches have to jettison the old idea of professional distance and work with their clients in a more personal way, emphasizing authentic openness, curiosity, and humility.